Traveling can be a lot of fun, but you can ruin everything, especially your mood, if you lose some of your belongings. Losing your documents, your money or tiny objects that have emotional value to you can lead to major complications, which is why it is important to keep a travel wallet close and wear it securely. A travel wallet is like a passport holder. Functional, practical and easy to use, such an accessory can save you a lot of trouble. Moreover, it can help you look and behave classier while traveling. Luckily, the market is filled with all kinds of travel wallets that you can choose from, depending on your style and preferences. Whether you prefer leather or synthetic materials, large or small wallets, there isn’t something that the market isn’t able to offer you. However, you should pay close attention to the features that make the wallets you are looking at buyable. What to look for in the best travel wallet? While some travel wallets are stylish and sophisticated, some are bulkier. The way your wallet will look after a period of time does not only depend on how you use it, but also on the quality of its design and fabric. If you know that you must carry with you a large number of documents, as well as cash, choose a larger size from the beginning, rather than trying to fit everything in a small wallet. To help you choose the best travel wallet for your needs, we have reviewed five of the market’s best-selling products. When analyzing them we have looked at all the above details, plus the price. Let’s not forget that not everything expensive is also worth your investment. If you are a heavy-duty traveler that is also organized and likes to leave nothing behind, then this travel wallet is for you. Affordable, large-sized and covered by lifetime guarantee, this case is exactly what you are looking for if your style is more of an athletic one. It might look bulky on a first glance, but it has so much to offer! What’s to like about the Travel Wallet & Family Passport Holder w/RFID Blocking Document Organizer Case? The fact that it is large-sized will help you carry it in a safer and more comfortable way. From a practical perspective, it is a great thing that it comes with zipper closure that will protect your documents on all weather conditions. Also, the fact that its dividers are well-organized and you can fit your entire identity in there, makes it a good investment. It is a highly functional travel wallet that will make your journeys more comfortable. This is a cheap, yet practical wallet. However, if you are planning to go on a business trip, it might look inappropriate comparing to your outfit or your luggage. It is best to keep it for leisure or sports travels only, if you don’t want it to create a huge discrepancy between your accessories. Are you looking for some of the cheapest and convenient travel wallets on the market? Then this product should be in the top of your list. This passport holder is large, practical and able to secure your documents and other valuable objects. It has a casual design and it can fit in credit cards, documents such as your passport, cash and thin objects. Just like most travel wallets, it includes RFID technology that blocks identity thefts devices. This wallet is great for all weather types, due to its 210D Ripston Nylon water-resistant fabric that makes it lightweight and breathable. When using it you can easily notice how the moisture and heat stay out. More than that, you get 100% lifetime money-back guarantee, which can make you feel even safer. 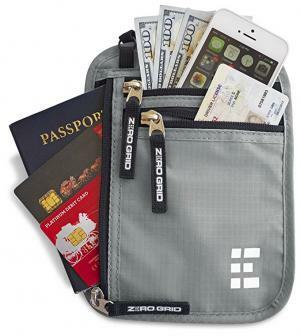 What’s to like about the Zero Grid Neck Wallet w/RFID Blocking- Concealed Travel Pouch & Passport Holder? This wallet is made for traveling and it helps you keep your belongings safe. The best thing about it is that it can fit in a lot of documents and that it offers a reliable RFID shield that you can trust to protect you against thieves. It can be worn underneath your clothes, in your travel bag and even in your pockets. Its organizers are suitable for any number of cards that you might have, as well as for cash and documents. Despite its many benefits, its design looks a little too cheap and you will not like it if you are a classy person that appreciates good-looking accessories. Feminine travel wallets are not easy to find. 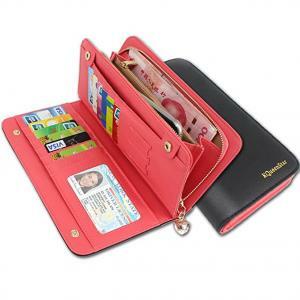 However, this product has everything that you need if you want to find a travel wallet that is girly, durable and able to secure your documents and money. It is made of PU leather; it is waterproof and has 1 bill bit, 13 card dividers, 1 grid for the change, as well as 1 photo bit and 5 secret dividers. It closes up using a smooth zipper and it has an oxidation-resistant metal accessory that makes it even more feminine and stylish. You can choose between black, green, pink, blue, purple and rose red. The great thing about its design is that you can also wear it as a clutch during your travels. What’s to like about KQueenStar Women Lady Leather Wallet Purse Credit Card Clutch Holder Case? This travel wallet will make you the happiest girl in the world, knowing that your papers and money are safe and secure while at a concert, traveling or while walking around the city with your friends. There isn’t something that this clutch won’t fit and its structure is functional and helps you stay organized. Although this is a great choice if you want to buy an affordable travel wallet, this product’s design has some minor flaws that might become annoying in time. For example, you have to struggle to fit your cards inside the slots sometimes in order for the wallet to close. Other than that, it is simply awesome! If you were to think about what is most important to you during your travels, what would you choose? Safety, having fun, creating amazing memories? Well, sometimes, you can have all of these things if you just choose the best accessories to travel with. This inexpensive travel wallet can help you keep your belongings safe, stay worry-free when it comes to you cash and cards and create some of the best memories because you have nothing else to think about than the present moment. 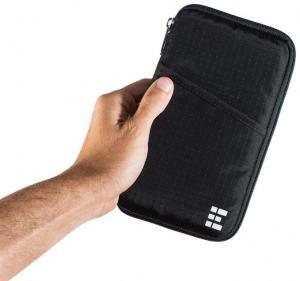 This holder integrates RFID technology, preventing your documents from being scanned by thieves, a well-organized wallet that has 6 large pockets, 2 zippered pockets and 4 credit card slots. This product’s material is soft and protects you from irritations in case you happen to keep it near your skin. Why buy this travel wallet? What’s to like about the Passport Wallet - Passport Holder - Travel Wallet with RFID Blocking for Security? Affordable accessories that make us feel comfortable and safe should always be our top choice. The best thing about this wallet is that it is roomy, waterproof and secured with RFID technology. Another thing that you should consider when thinking about buying is its lifetime money-back guarantee coverage. Although it is one of the best cheap travel wallets on the market, its design could be focused more on the aesthetics. However, safety first is our motto and if you agree, you shouldn’t think twice. Do you want to make an impression when taking your travel wallet out of your purse? Or you are a guy looking to buy a stylish, yet inexpensive gift for your girl? Then take a look at this clutch. It is inexpensive, it has a sophisticated floral model and it is made of faux leather, so she will know that you are trying to protect both her and the environment. Its 7.5 x 3.7 x 0.8 inches size is great for casual walks and international travels, as it fits everything that one needs: cash, cards, documents or pictures. Being made of PU leather, it is soft, durable and comfortable to use. Also, its design is elegant and chic and can be combined with any type of outfit. 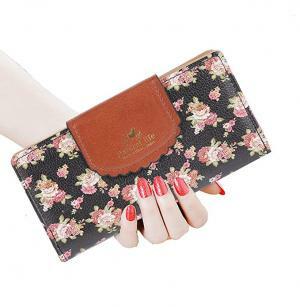 What’s to like about the SeptCity Women’s Wallet Cute Floral Soft Leather Clutch Gift for Her, 2071? Finding a travel wallet that is functional, nicely designed and easy to use isn’t exactly easy, giving the many models on the market that are way to minimal for a traveler’s taste. This product offers the advantage of having plenty of dividers and slots and therefore, it is an organized person’s best friend. This is probably one of the best travel clutches with a girly design out there. However, it does not offer the safety features that other wallets offer, which makes it easy for thieves to easily steal your personal information while at a concert, a crowded market or a simple walk on a busy street. How are travel wallets different than regular wallets? When traveling, it is always important to choose accessories that make your life easier. At the same time, it is essential to be able to organize your personal belongings, your documents and your money easily, so that you can find them right when you need them. This applies for luggage, organizers and, of course, travel wallets. The main difference between a travel wallet and a regular one is that you can store your documents more comfortably, such as your ID or passport. Your money and cards have their own designated pockets or separators, so you don’t have to worry about that either. Although travel wallets are often not as classy and elegant as business models, for instance, they are extremely practical. What is even more important is the safety factor. They are usually secured using zippers and some models even include RFID blockage, so that identity thieves cannot threaten your safety. Is it possible to find classy travel wallets? There are plenty of travel wallet models on the market and it is true that most of them are designed to be practical and not necessarily beautiful. However, there are models that are suitable for business traveling and that come with a more appropriate design. If you want to have all of your documents, money and cards in one place, but you still want your wallet to be compatible with your outfits, then you can surely find something that suits your needs. What you cannot expect, though, is to find a travel wallet that is small and extremely thin. It is easy to find leather models for both male and female, but you should expect them to be large-sized. Having this type of design is normal, as they are built with practicality and safety in mind. If you aren’t satisfied with this answer and you want to find a middle way, then you can go for a regular wallet that has safety features and an additional small carry bag or card holder for the rest of your stuff. What are the best travel wallets? The best travel wallets surely include some of the most advanced designs that include RFID pockets and smart compartments. Storing your personal items and money in the safest way possible is essential, which is why some of the wallet manufacturers have insisted on adding zippers to the models they created. The best travel wallets aren’t the most attractive, though. They are usually bulky and sporty, but they offer everything a tourist might need. Except for the RFID pocket, you should also look for water and wear resistant materials, flexibility, a large number of dividers, a hidden pocket, a money clip and a functional design. Most travel wallets are inexpensive, which is why it is a pity not to buy one. At a first glance, keeping your regular one with you even during your travels might seem more comfortable, but in reality, it is what can cause the biggest problems during a trip. Buying the best travel wallet for your needs can be easy if you know what you’re looking for. Sometimes, it is not enough to know what design you are looking for, but also what functionalities you need in order to keep your documents and your money safe. Make your journeys more comfortable and more enjoyable by choosing the best travel wallet. Although this might seem the least important object that you could bring with you in one of your travels, its presence in your luggage can mean a few days of worry-free time, in which you lose nothing. The 5 travel wallets above are some of the best products that you can choose from. Analyze their features, their price and their designs and make sure that you pay for what you really need. Choose the first product if you are looking for a rather classier travel wallet, the second one if you are person of sporty tastes, the third if you are a girly traveler. Choose the last two products if you are looking for the most inexpensive, yet high-quality cases or holders on the market. Also, make sure that you let us know if you found another travel wallet that is worthy of our attention.